An increase in ecotourism has led to greater boat traffic, which kills or injures a large number of manatees. Today, their numbers are dwindling. 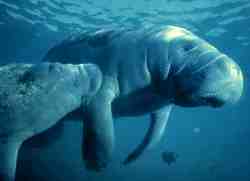 The manatees will always be in danger of local extinction until boat traffic through this important habitat decreases. The canals and coastal waterways along the northern Caribbean Coast of Costa Rica are home to a small population of West Indian Manatees (Trichechus manatus). Ironically, manatees are being threatened by conservation designed to save a single species: the green turtle. Although manatees have returned to the area, they are in between a steadily expanding agricultural frontier to the west (banana plantations), and green turtle ecotourism from the east. Manatees are caught in the middle. Recently claimed to be extinct in Costa Rica, a population of manatees has been located in the rivers and lagoons adjacent to the world famous green turtle nesting beach at Tortuguero National Park. Manatees are also being protected at the Gandoca Manzanillo Wildlife Refuge. The rediscovery of a manatee population is very significant, because it shows the importance of this particular location as a preferred habitat. Fast motor boats full of tourists heading to the beaches of Tortuguero (to see the turtles) race through the lagoons, rivers and canals from Moin to Tortuguero and sometimes collide with slow moving manatees. More importantly, they scare manatees away and chase them to the backwaters, where motorized boats do not go. Pesticides used on banana plantations kill fish and may be causing aquatic changes, especially in these shallow backwater areas.